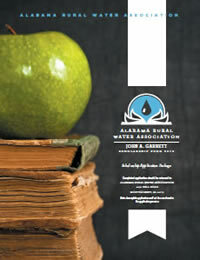 The Alabama Rural Water Association offers educational scholarships annually to deserving individuals through the John A. Garrett Scholarship Fund. Six scholarships will be offered to individuals who meet the criteria described within. 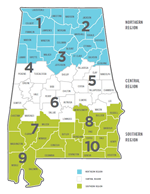 Two recipients will be selected from each of three regions North, Central and South, as shown on the Alabama Map enclosed in the amount of $750 per recipient. We ask that you provide each of your employees who may be interested or have children who are interested a copy of this package. Where more than one child in a family or more than one employee in a utility is interested, each is eligible to apply. The application must be completed in its entirety and the utility must be a current member of the Alabama Rural Water Association. To insure continued growth in the number of certiﬁed water and wastewater operators in the State of Alabama, three of the six scholarships will be offered to individuals striving to enhance their professionalism by attending Alabama Water or Wastewater Operator Certiﬁcation Courses for Grades I-IV certiﬁcation examination preparation. This is offered to expand the educational opportunities of those individuals interested in water and wastewater industry careers. We hope you will take advantage of this opportunity. Please note the application package must be postmarked no later than Saturday, March 30, 2019. Any package received with a later postmark will not be considered. If you have any questions, please call the ARWA ofﬁce at (334) 396-5511. Congratulations to all who applied and especially to those selected as the 2018 winners! Each year, the month of May brings another school year to a close. It is also a time to offer assistance to many young graduates who are interested in continuing their goals to include a higher educational degree or certification. The ARWA has for many years organized an Annual Golf Tournament Fundraiser in support of the John A. Garrett Scholarship Fund. The Scholarship Program is governed by a Board of Directors consisting of Greg Dutton, President; David White, Vice President; Randolph Hall, Secretary/Treasurer for the organization of this tournament. Applicants are judged on scholastic and leadership abilities as well as their community involvement. For 2018, 21 application packages were received and the following winners were selected. Kevin is the son of Paul Brown, Operator of the Rogersville Water Works & Sewer Board in Lauderdale County. Kevin is a 2018 graduate from Lauderdale County High School with a 3.6 GPA. Kevin is planning to attend Snead State Community College where he is pursuing a Degree in Physical Education. Garrett is the son of Bradley Sanders, Assistant Manager for the Odenville Utilities Board in St. Clair County. Garrett is a 2018 graduate from St. Clair County High School with a 3.9 GPA. Garrett is planning to attend Birmingham Southern College where he is pursuing a Degree in Engineering-Teacher. Reagan is the daughter of Shay Gregory, Office Manager for Loachapoka Water Authority in Lee County. Reagan is a 2018 graduate from Reeltown High School of Tallapoosa County with a 4.0 GPA. Reagan will be attending Auburn University or Southern Union where she is seeking a Degree in Nursing. Scarlett is the daughter of Pamela Wilson, Billing Clerk for Chilton Water Authority in Chilton County. Scarlett is a 2018 graduate from Chilton County High School with a 4.0 GPA. Scarlett will be attending the University of Montevallo where she is seeking a Degree in Theater. Griffin is the son of Dennis Howard, Water Superintendent for Jackson Water & Sewer Board in Clarke County. Griffin is a 2018 graduate from Jackson High School with a 4.0 GPA. Griffin is planning to attend the University of Alabama on the pre-med track pursuing a Biology Degree. Keri is the daughter of Jamey Sullivan, Operator for the Jackson Water & Sewer Board in Clarke County. Keri is a 2018 graduate from Jackson High School with a 4.0 GPA. Keri is planning to attend Auburn University and pursue a Degree in Chemical Engineering. selected as the 2018 winners!